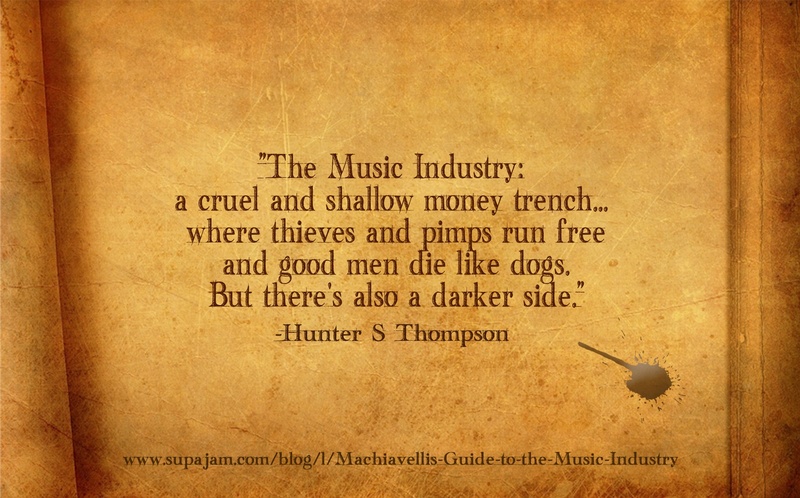 As Hunter S Thomson once said, "the music industry is a cruel and shallow money trench... where thieves and pimps run free and good men die like dogs." But there's also a darker side. And that's why, this week I want to tell you a story about one of the most talented artists I have ever had the fortune to work with. An awesome songwriter, an incredible singer and one of the best guitarists I've ever known. This person really did have it all. I knew it would really only be a matter of time before music industry execs, waving big wads of cash, came knocking. And that is exactly what happened. Only it turns out that the deal that they offered was not actually the perfect deal. But on first glance, this one bore all the hallmarks. Of course the company would be entitled to 82% of profits earned in return for investing in the individual. A pretty standard deal. In return, the individual would be entitled to an advance which would be paid back from their share of the profits once the company had recouped its 'costs'. Again, perfectly normal. But in this case there was no cash advance. The company would invest money into recording and PR on behalf of the artist. Now unfortunately this isn't an unusual state of affairs in these straitened times. And even more unfortunately, it was not immediately obvious that the company providing the services bore any relation to the one the contract was with. But worst of all in this circumstance, the company was not actually a real record label and the agreement signed was not actually a recording deal. It was in fact a thinly disguised management deal - a deal which bound the artist to the company. So that if their talent did attract the attention of a 'real' record label, the company would be entitled to not only 82% of the advance, but 82% of the artists share of any profits going forward. And because the term set out in the agreement was not certain (the time period was set by reference to the release of a given number of records) it would almost certainly require litigation to get out of it. And that will probably be enough to ensure that, no matter how talented that artist is, a real record label will never go anywhere near. Which brings me to the point of today's blog: a manager can either make you or break you. A "good one" can be the architect of your strategy to rule the world, the brand consultant who will help to focus you and realise your dream, the marketeer who will get you out there, the book-keeper who will keep you solvent, the tour guide who will plan your tour and the taxi driver who will get you to your gigs. A "bad one" however, can screw you. Forever. And sadly, I see more in the latter camp than the former. But how do you differentiate between these two types? There aren't any qualifications in the subject that you can rely on (if there are they almost certainly aren't worth the paper they are written on) and there aren't any lists of them published by a reliable industry body. So let's start by mapping out why you might want one. As I've mentioned in earlier blogs, record label budgets are very considerably smaller today than they have been in the past. As a result they tend to be looking for something which is much more fully developed than they might have done in the not too distant past. This has left a huge tranche of bands and artists, who once might have been good enough to grab a demo or development deal from a record label, with nowhere to go. And just as nature will do its best to fill a vacuum, the retreat of record labels from the development space has seen a rush of individuals (from recording studios to management companies) trying to fill it. Let's be clear on this: they are all hoping that they will make money from your talent. So before you sign up with one, you'll want to know that they are competent, that your interests are aligned with theirs, and that they have some clue about what they are doing. Because, if you are going to be tied to them for the next five years, you are going to need to be pretty damn sure that they are right for the job. Right? Now there are companies out there who are doing it right. Raw Power, for example, has an amazing track record for signing bands, investing in them, developing them, touring them, honing their PR machines, releasing their records, opening doors for them and getting them signed to record labels. Their current roster for example includes Bullet for my Valentine, Don Broco and Kids in Glass Houses. But they can't sign everyone. And indeed if they did they wouldn't have the fantastic hit rate they've shown in the past. So how do you get spotted by them? Or a similar large management company with the knowledge and resources to help you get to the next level? Well, you can start by reading the earlier columns in this blog series. Because the best of the management companies are looking for something very similar to the record labels. Just as importantly, you need to think about how this person might hold you back - whether by design, as in our example above, or by incompetence. Because if you later realise that your new manager has character traits or failings that make them a liability and you are contractually bound to them for the next five years or even longer, you may rue the day that you ever got involved. Trev, is a record producer and Chief Engineer at one of the UK's top studios, Circle Recording Studios in Birmingham. Check out his personal blog at www.circlestudios.co.uk/blog. If there's enough interest in this issue he may even talk about how you might structure a deal with your management to protect against the kinds of things mentioned above in a future one. Thanks to Iain@individstudios.com for doing a fabulous job on the artwork above!